Like most new homes in the 1990s, the PVRES floor plan features lots of lighting from recessed cans — thirty in all as shown in the top photo. In the standard home, each of these contains a 75W R-lamp incandescent bulb. That's a connected lighting load from recessed cans alone of 2.25 kW! Previous research at FSEC has demonstrated the large savings potential of using compact fluorescent lamps . Our standard home will use the standard lamps. However, for our PVRES home, we took advantage of available technology from the Sylvania Corporation. 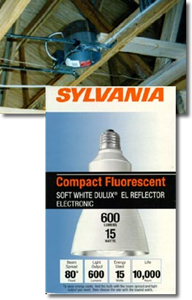 They provided three dozen Sylvania Dulux EL15W lamps, shown in the bottom photo, for installation in the recessed cans of the PVRES home. The lamps fit wherever a standard R40 lamp will fit. It provides virtually identical light output to the 75BR30 lamp and uses only 15 watts (600 Lumens) rather than 75. It also lasts an average of 10,000 hours of use rather than 2,000 for a standard incandescent lamp and thus will seldom need changing. Best of all, we will cut the installed lighting demand by almost 80%.